1. What are some of the factors that brought about the ARW? The movement towards independence had just received the kick-start that many were hoping for. In fact, it was not the first and only tax imposed on the colonies without their consent or any form of consultation. The colonies refused the Stamp Act (1765) and violence took the streets. The British Parliament, for the next few years thereafter voted other laws, the next one being more coercive than the previous, only to realize too late that they were now separated from America not only by a vast ocean, but also by a vast difference in their political views. A war for political independence was just around the corner in 1775 and the British never saw it coming. The colonies tried in many ways to manifest their disagreement to the British Parliament. The people itself had its own ways for expressing their refusal of many unbearable taxes, even the one on the imported tea. 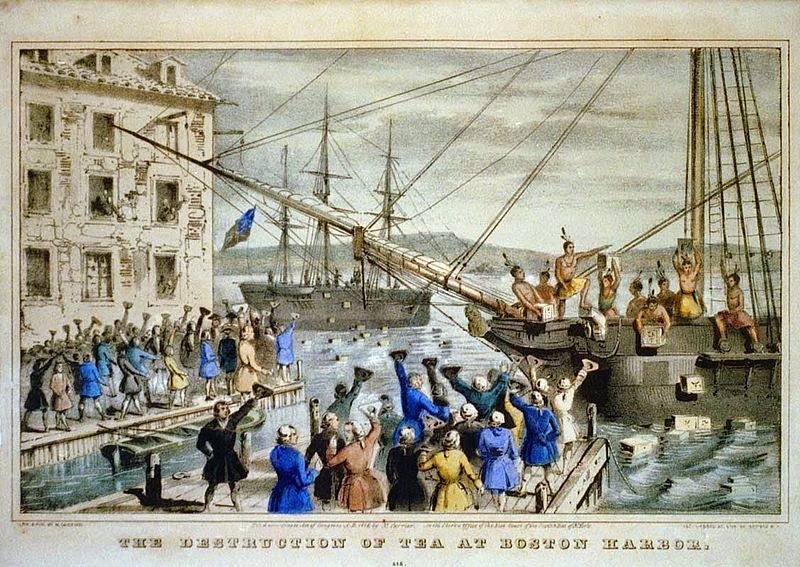 In 1774, the opportunity came up in the port of Boston where a ship loaded with tea arrived. Angry citizens climbed aboard and threw the whole shipment overboard. From 1773 and 1775, various propositions were put forward by the colonies to reach a middle ground. Nevertheless, Britain kept on pushing the colonies in the corner, not expecting them to resort to a military solution to solve a political problem. It was more than a difference in political views: the colonies couldn’t progress while being considered as simple and obedient subjects to a government on the other side of the world. Independence was long overdue in 1775 and a war had become unavoidable. The issue of that war would serve as the final decision to resolve this unsolvable political conflict. 3. Let’s make it short and decisive! Since the British government wanted to end the American revolt before it would drag England in another never-ending war, they hired German troops at the very start. The German mercenaries were already known for their efficiency. But, before they could get to America, war was already on the way and Britain had lost its first battles in Lexington and Concord in Massachusetts. 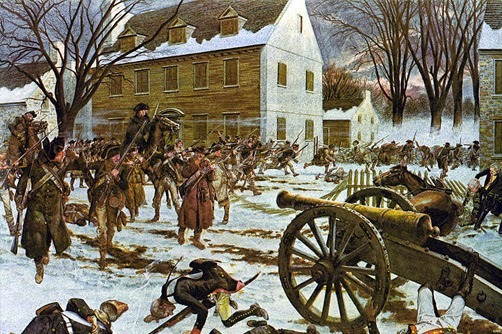 The British troops had to retreat to Boston where they were surrounded by an enraged militia, citizens of all walks of life that had left their families to put their lives in jeopardy in order to settle this matter. 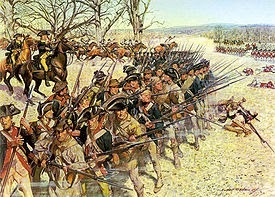 A succession of battles would be fought during the first few months after the battle of Lexington. On both sides, Generals and subordinates were being replaced, as they were getting ready for a long war. Time for political diplomacy was over when General George Washington was given the command of the Continental army, the Patriots. Fresh British troops were arriving one ship after another, soon followed by the German regiments. The Continentals ran quickly out of gunpowder. They had to import some two million pounds from friendly countries. France seized the opportunity to supply the Continentals with this badly needed resource. France had lost the Seven Years’ War not long before and was eager to take it up again with England. The Continentals, fearing an intervention by the British once in Quebec, a neutral and safe ground for the arriving British and German troops, sent troops up to Quebec and Montreal to cut off that route. General Guy Carleton was in charge of the British troops in that area. He inflicted important damages to the Continental militia who had to retrieve to Ticonderoga. 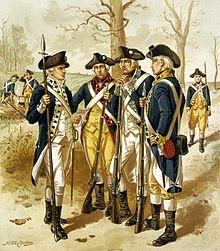 Even with a reduced army, the Continentals had reached their main goal: preventing British troops from coming down to New York from the North. The Continentals were, nevertheless, slowly loosing another battle, the one of the public opinion. Their tactics of invasion were feared. Cities and villages were becoming battlegrounds, something that the general population had not anticipated. If the Quebecers went along with the Continentals, at the start, their morale support soon faded away. because they too wanted their independance from England. Even with the help from the Germans, the British army had only one strong force between New Hampshire and Georgia: Boston. The Continentals had formed a temporary government in each of the thirteen states and were ruling. The Loyalists were less organized. Nevertheless, along the way, they were able to form some 60 militias or provincial regiments along side the British and German troops. In 1781, it was clear that Britain was fighting an already lost war in the hands of the Continentals. One of these provincial regiments was the King’s American Regiment of which Philip was a member from 1781 to 1783. The first time that the name of Philip Long appeared on a muster roll is the one of the West Florida Royal Foresters, a discovery made by Ghislain Long. Since that discovery, and that of many other muster rolls showing Philip in the King’s American Regiment, this document has baffled everybody. We knew from one of Philip’s letters that he referred to his participation in the war as early as 1775. So, between 1775 and 1781, where was he? This « gap » in his military and civil life has led to numerous hypotheses on our part. We all assumed that, once this gap filled, it would lead us to his birth place. The reasoning behind that hypothesis was pretty straightforward. But, filling the gap proved to be a challenging task for all of us. I remember very well, some years ago, I leaned toward the possibility that he was a British soldier who had been sent to help a militia to organize itself into functional regiments. The militia was very often formed on the church steps with regular citizens without any training whatsoever in the science of war. I worked with the PRO in London, but they couldn’t find any trace of Philip Long in their regiments. After a few months of research in 2007-8, I decided to call it quit. To my knowledge, nobody else took this hypothesis seriously enough to find significant documents. Let’s come back to the ongoing war. 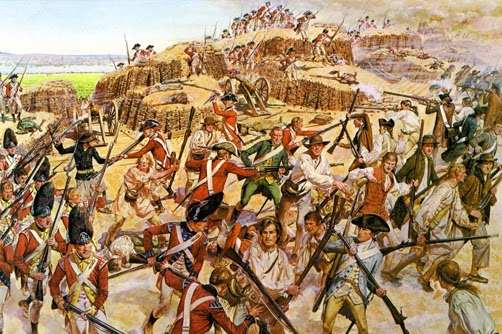 In 1776, British General Clinton was defeated in every attempt made to conquer the North and South Carolinas. 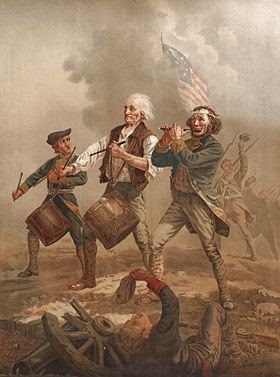 The campaigns in Britain and Ireland to organize and send troops overseas were time-consuming and those troops arrived too late to compensate for the ground already lost to General Washington from 1775 to 1776. But, when a defeat seemed inevitable in 1776, Britain managed to sent some 32 000 troops in America, the largest demonstration of force ever launched by England, and by any other country in the known history of mankind. With war comes strategic errors, and the British made some, costly ones. The British chose to divide their forces into small units. The Continentals, on the contrary, were regrouping and making significant progress as soon as 1777, even to the point of capturing 1 000 Germans soldiers caught by surprise during a cold night of December. The daring strategies of General Washington were producing significant results. 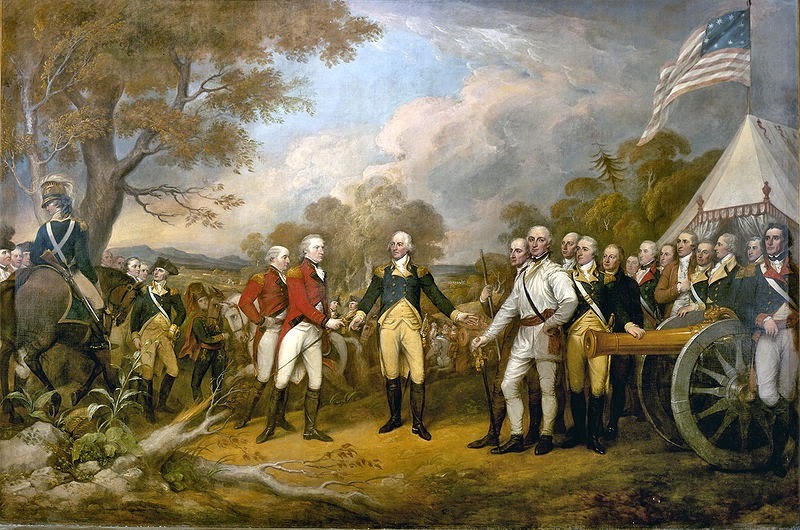 The first surrender of the war by the British, General Burgoyne in Saratoga NY (1777), was an alerting sign that the Continentals were one step ahead of the British. But, one day, victory was near for one side; the next day, the other side had made more captures than they could handle. Nothing was decided, yet. The war was increasing in intensity and in cruelty for the soldiers. As the officers on both sides were playing chest with their regiments, the soldiers on the battlefields were fighting to stay alive against their opponents and diseases. In the second phase of the war, the British officers, fearing the intervention of France against them, decided to invite the Continentals at the bargaining table. The following document summarizes the unexpected turn around by the British Parliament during that period. Behind that generous offer, Britain was secretly planning to punish severely the Continentals for their rebellion against their mother country, once the Patriots would have stored their guns. The Continentals turned down the offer. 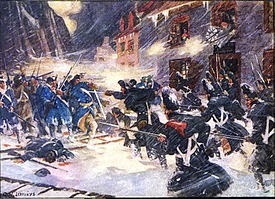 The last battle in the north was held in 1778. Sir Hillary Clinton had regrouped in New York. The arrival of the French regiments gave a boost to the British army, but not for long, since they had to move their troops a long way to come to the rescue of other southern regiments in a shaky position. 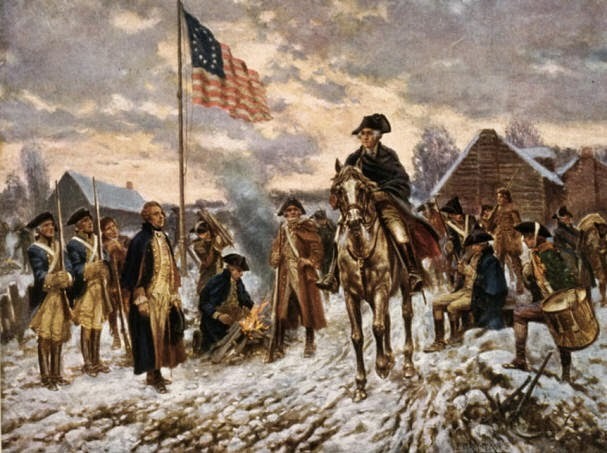 At the same time, General Washington had his hands pretty full when he was faced with mutinies and a breakdown of confidence within his troops. During the first years of the war, the battles were held in the northern colonies. With the arrival of the French soldiers, the battlefield shifted towards the Southern Colonies. The British captured Savannah, Georgia in 1778, and Charleston in 1780. The British had seized the two major cities in the South. In the following year, the Continentals regained control of South Carolina and Georgia. It would be the very last turnaround of the war. The British had lost the war to the Continentals. Independence Day would soon arrived, the next day that the last Loyalist would leave New York. Philip Long was one of the last ones to leave the port of New York in 1783 and one of the last ones to receive a parcel of land in Meductic, NB. the ARW of 1775-83 and who won each one? The table below gives you an overview of the main battles and who won in each case. Surely, there were more battles and skirmishes, but these battles in the list are considered the most decisive ones.